Activision and Sony’s honeymoon period appears to be progressing nicely with word of yet another platform exclusivity deal out of the PlayStation E3 2016 briefing. 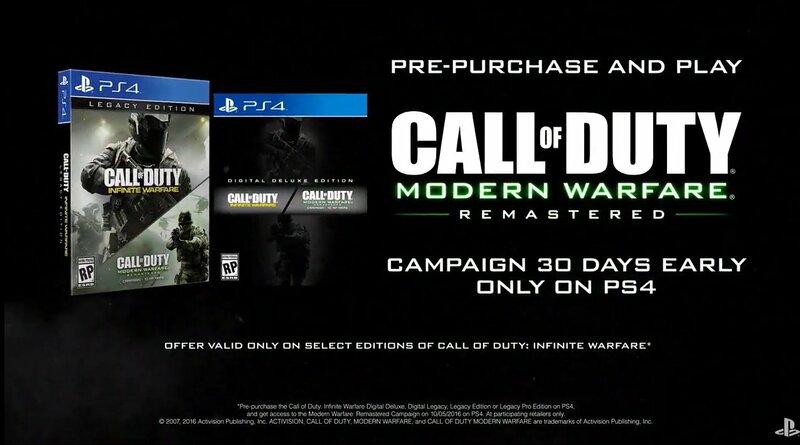 If you preorder Call of Duty: Infinite Warfare on PS4, you’ll be able to play Call of Duty: Modern Warfare Remastered 30 days ahead of PC and Xbox One players. The exact wording of the slide was “pre-purchase and play Call of Duty Modern Warfare Remastered campaign 30 days early only on PS4”, which suggests it might be story mode only, rather than multiplayer. The fine print notes that this only applies to “select editions”; Modern Warfare Remastered is included with the Legacy Edition and digital deluxe copies only, and won’t be sold separately.